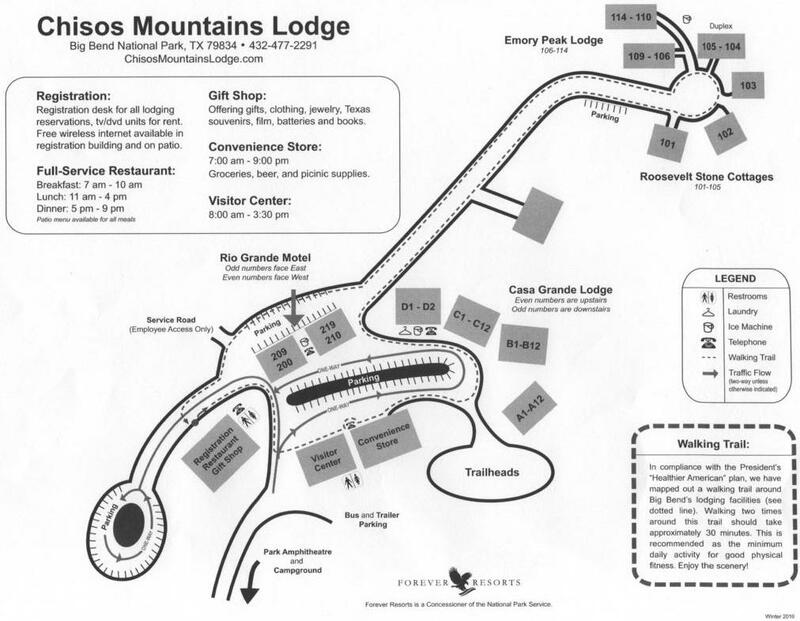 As noted from another post, on my recent visit to the park my wife and I stayed at the Chisos Mountain Lodge. As we did spend a fair amount of our time in the Basin/Lodge area, I wanted share my thoughts about this experience here in a separate thread. My first impression of the room was that it was clean, there was no TV, and as I walked across the room the floor was lightly sound insulated - making me glad that I was in an upper unit. All of the furnishings and appliances seemed like they were about 20+ years old, but otherwise kept clean and orderly looking. I would find out the next morning that the coffee maker was broken, but I managed to make "camper's coffee" in the decanter using the microwave. The small refrigerator came in handy to unload the ice cooler of fruits, cold cuts, and assorted soft drinks we brought on the trip. However, the refrigerator was either not quite cold enough or acted like a partial freezer - with no happy medium. As for comfort, the bed was an inexpensive type but comfortable enough. The frame however was quite old, and made a lot of noise when changing position on the bed. One interesting thing about the room was that I never turned on the heater. The temperatures outside dropped to the mid 20's, and it stayed very comfortable in the room at all times. I sort of think this was due to good external and roof insulation and the fact that the mini-fridge ran all the time giving out heat. Our first night in the room, I slept very nicely - especially after the intense hike up and down Pinnacles Trail. On our second and third nights (Friday and Saturday) we got some new next door neighbors who were apparently teenagers. They seemed to be a very nice group, as I got to know them quite well through the ultra-thin walls of the room. On Friday night, I wanted to get to bed a little early in order to hit the trail first thing in the morning. At about 9:30PM I was awakened by someone tuning an acoustic guitar, and a young lady practicing some singing chords. A few minutes later, they broke out into full song. I was about to get up and ask if they could hold it down a bit, but they were singing some softer Christian type of songs - and I have to admit they were pretty talented. My wife advised me just to enjoy the music and try to fall asleep to it. Fortunately they only wanted to play about four songs and call it quits as well. The next night however, they rented a TV and movie from the main office, and got to hear Raiders of the Lost Ark if (I am not mistaken) for a couple hours. I should also mention that we ate at the Chisos Lodge Restaurant a couple times, and the food was good - certainly better than a Mountain House dinner. As I was ordering my first dinner, I asked for suggestions, and the waitress recommended the chicken soft tacos. I was actually interested in a hamburger, but she scrunched her face, and advised me to go with something else. I asked why, and she quietly admitted that the patties (and other things) are cooked/prepared elsewhere and brought in only to be reheated. So I opted for the chicken tacos - which were certainly tasty. My wife got the chicken and pasta with marinara, and it was also very good. The other amenity at the restaurant area was the free wireless access point for laptops. I brought a laptop, and it was nice to check some emails back at the office quickly. The final note to make here, is that I passed the Stone Cottages each day, and they looked quite nice. Even though I plan to mostly camp in at tent at BIBE, if I ever stayed in the lodge again, I would try to get one of these rooms. This will probably be the case if can't convince my wife to sleep outdoors in our tent. I'd agree that the 'motel type' room we got at the lodge in Feb '08 was clean, but otherwise not very noteworthy. It wasn't air conditioned, but with crank open windows on both the front and back of the unit I doubt one would be needed. &nbsp;These rooms were definitely a cut above the motel type rooms near the big parking lot. &nbsp;Had a nice vaulted ceiling with a ceiling fan. Bathroom was a bit cramped and had very dated looking plumbing, but everything worked. They charged me $116/night as a walkup. If there was any drawback, it was a bit of a climb from the parking area as this unit sat behind another row. &nbsp;Well worth the walk, in my opinion. Regarding the restaurant, I found the Chisos cheeseburger quite good, and tasted freshly grilled. I walked past the salad bar and it looked fresh and appetizing. The first week of February we stayed in building B for 5 nights. The family slept inside, I slept on the roll away bed on the balcony. Went to sleep looking at Mount Emory and the stars. Got down in the low 30s but I slept great! Re: Who will be in BB over Christmas holiday? Here's a question: Which lodge rooms are the Rio Grande, versus Casa Grande and Emory Peak? We've got a Rio Grande motel room. The Rio Grande rooms are the older units that are in the two buildings that are closest to the Main/restaurant building. I prefer them for several reasons. Nobody is banging around upstairs while you are trying to sleep, and there are no stairs to climb when hauling stuff up to the room. There is a built in counter which is higher than usual, sort of like a work bench with a shelf below. I like that feature a lot as it's perfect for in room meal prep or just working on gear. The wife acceptance factor is usually less than for the Casa Grande rooms. Painted cinder block isn't as "nice" or some such. There also is no balcony only a chair or two outside your front door, not private. You'll either be facing Casa Grande (much quieter) or the big parking lot (window view). Unloading and loading is a little easier from the parking lot on Casa Grande side even if your room is on the other side. Stay healthy and have a great trip! I've stayed in both RG & CG rooms, but never the Emory Peak or cottages. Just couldn't remember which was which. Does the attached map look correct or are there 3 CG buildings? Or is one of the two I labeled as Emory Peak a service building? Oops, attached file was lost during a file server move. I think that there are 4 Casa Grande buildings all built in 1981? Three are the same and the one closest to the Rio Grande buildings is single story (my favorite of the CGs but only 2 rms available) and also has some laundry/maint. functions. The Emory Peak rooms are down across from the cottages and are similar limestone construction. The cottages are self standing where as the Emory Peak rooms are 3 or 4 in a row under the same roof. No A/C at that end of the road, heat, ceiling fans, and screened windows only. So to answer your question about your labels, I think it still needs some work. We stayed in the RG motel in May of '09. The rooms were clean, beds were comfortable. Several power failures during the week, which forced some meal time re-scheduling, but the food was very good. It rained several times during our visit, and the roof over the walkway had some serious leaks. No leaks in the room, just over the center of the walkway. A few weeks ago I spent two nights in Roosevelt Cottage #102. A buddy of mine was preparing for a 3 day trip of the Outer Mountain Loop (here is a link to the excellent trip report he did of his experiences on the OML: http://www.bigbendchat.com/portal/forum/your-trip-reports/solo-counter-clockwise-oml-33041-t9388.0.html;msg90243;topicseen) and I went down to BBNP to see him off (can't miss an excuse to head down to Big Bend). The Roosevelt cottage units have three double beds, two in a larger open room and 1 in a small room that has a curtain (no door) for a bit of privacy. Stone walls, stone/cement flooring, motel size refrigerator, 4 person table, hair dryer in bathroom, and a large stone patio. These cottages (there are actually 3 of them - 101 to 103) were built by the CCC back in the '30s I believe and have been renovated slightly over the years. Unit #103 is the premiere unit with fantastic views of The Window from the outdoor patio. The unit we had also had nice views and by moving to one edge of the patio, you could see The Window clearly. Unit 101 does not have the view but is still a nice cottage. Parking is ample up at the cottages and shared with the Emory Peak units (which I have also stayed in on a previous park visit - these units don't have quite the view of the Roosevelt cottages but are a little bit larger with a separate room for better privacy). The walk down to the lodge is a bit further than from any of the lodge units but nice although make sure you take a flashlight with you if venturing out after dark. We lucked into this unit as the assignment is pot luck when arriving at the basin. I was surprised to be able to book this cottage about 2 months prior to arrival but that was probably due to either a cancellation or the fact that we were just using the cottage for only 2 nights. 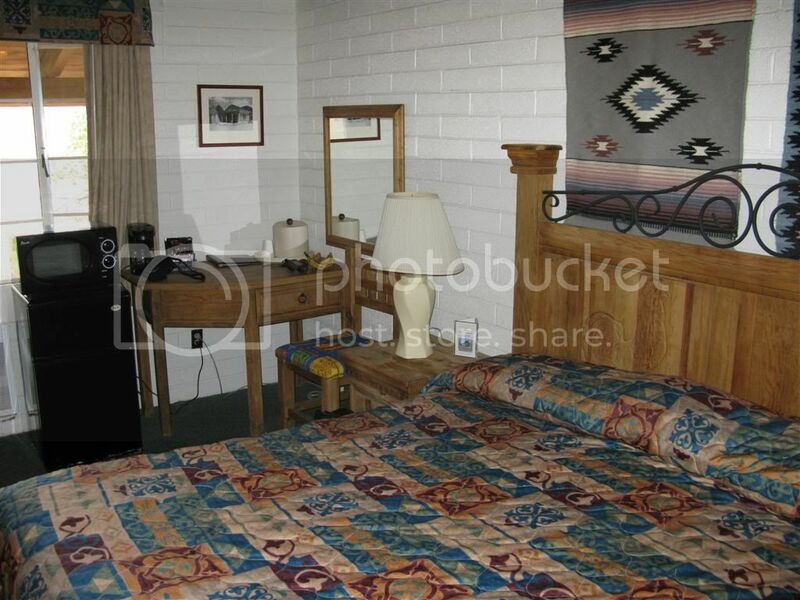 Cost was $152/nt., which is higher than the lodge (motel style) rooms. But hey, they are unique and worth it for a change from the other more traditional units in the basin.